With the vast number of watches on the market, choosing the one that's right for you can seem a little overwhelming. The key to choosing a watch lies with identifying your priorities and making sure the watch you select fits your budget and lifestyle. Before you can begin looking at styles, you need to decide on a budget for your purchase. How much can you afford to spend? If you're on a limited budget, you may not want to shop for designer watches; however, you'll still have plenty of beautiful options to choose from. How you use your watch will also affect your purchasing decision. Will you be using your watch during diving or hiking? Will you be wearing your watch to the office? Will this be an evening watch to accessorize those special occasion outfits? These questions will help you decide about the type of watch you need. Sports watches - Active sports take their toll on a watch, so choose a watch that's durable and designed for your activity, like the Nike + or the Garmin Forerunner. Many people choose timepieces with a tough titanium case and scratch-resistant dial covers. Also, look for screw-down crowns and high water-resistance ratings to keep out the elements. Diving watches - If you are a diver, you'll need a special kind of watch that can withstand increased pressure from water. Marketed as "diving watches," these include options like the Citizen Promaster. Casual watches - For everyday wear, you may want a casual watch like the Swatch Color the Sky. This could feature a digital or analog display, depending on your preference. Ideally, a casual watch will be very comfortable. Chronograph watches - Chronograph watches, like the Square Angel Diamond from Invicta or the Bulova Diamond Chronograph do more than tell the time. They also have stopwatch functions, and they sometimes tell you the date, phase of the moon, and other helpful information. Designer watches - Running the gamut from casual to formal, designer watches like Rolex Lady-Datejust or the Tortue Watch from Cartier, give you a chance to admire your favorite brand every time you glance at the time. These tend to be pricey, so they are best if you have a substantial budget. 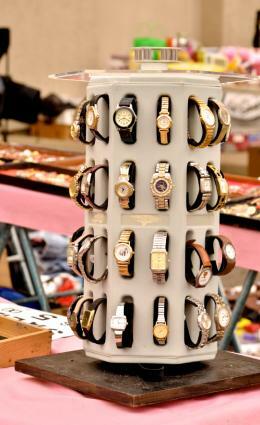 Diamond and gold watches - For the best in high-end timepieces, choose a gold or silver watch with diamond accents. These watches, like the Cartier Baignoire or the Bulova Precisionist Brightwater, often become family heirlooms. Formal watches - If you need a watch for a special occasion, a formal watch like the Bulova Crystal style or a Swarovski crystal watch from Pulsar, may be the best option. Typically, these designs are similar to formal jewelry in style. Pocket watches - For a classic look, nothing beats a pocket watch. Smaller styles, like the Lotus Half-Dollar pocket watch and this antique design watch from Gotham, are perfect for women and allow you to check the time without the annoyance of a watch on your wrist. Necklace watches - Necklace watches, like the decorative floral enamel pendant watch from the Metropolitan Museum of Art or a polished pendant watch from Gotham, are another fun alternative to a wrist watch. These are better as an accessory, rather than for everyday wear. Bracelet watches - Perfect for formal occasions, as well as any other time you want a special watch, bracelet or bangle-style watches are a pretty option. Consider the Stud Bacelet Watch by Coach stainless steel bangle watch. Can you adjust the band to get a comfortable fit? Do the links of the band pinch your skin in any way? Will you be able to easily change the watch band if it wears out or if you want a different look? How easy is it to adjust the band to customize the fit? Is the watch too heavy? Is it too bulky? Will it catch on your sleeve or pocket? For pocket watches and jewelry watches, check that the watch isn't too heavy or cumbersome. Ultimately, the best watch for you is one that you really like. If you choose a watch that has the features you need and is comfortable, you'll have a timepiece you'll love for years to come.